My assignment from Get It Scrapped! : Make a page with a monogram used in a creative and prominent way. I can accept that challenge. This page is about how my husband and I used to communicate when we were apart. To convey the double meaning of the letters, I cut them as fancy monograms with my Silhouette. I also cut a monogram flourish to use as an embellishment. 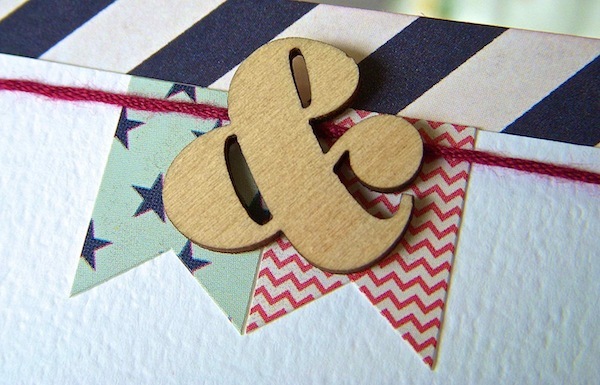 The wood veneer figures and ampersand are further clues. All is revealed at the end of my journaling. You can see what the rest of the team did with their monograms in the article here. Are you ready to get creative with your techniques and materials and embellish your next page with a monogram? 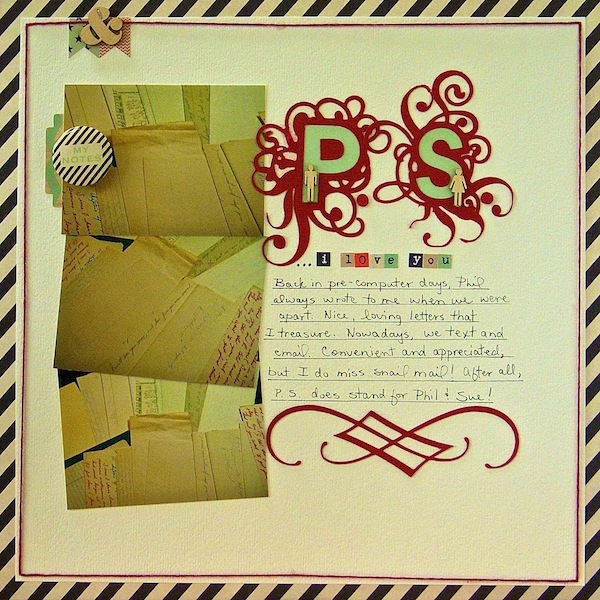 what a grea layout and i totally miss snail mail. i still send notes and cards to friends all the time. Great flourishes. I really like how you personalized the monogramming and made it stand out. I miss snail mail too but love sending notes when I can. I love the monograms. Such a pretty page! Such a wonderful page! Your monograms are beautiful and the little wood veneer people are perfect here. I love how you incorporated your initials into the story. I bet you do treasure those notes. Love this page - pretty soon you're going to be doing a similiar page as an ode to your Pretty Silhouette, aren't you? But it's okay, I won't tell Phil. This is fabulous! Love your title work and the story. Ah, the days of letters. So long ago! What a fun layout. Neat that you saved all those letters! Love comment about PS standing for Phil and Sue. Love the use of the Monograms, Sue! Those letters are really awesome with the flourish look! And what a great story to document! What a great idea for your monogram page! Robbie and I met when email was already popular, but I printed out the chats and emails from our "courting" days and want to do a mini-album with them someday.